This, is Shackle! A Kirby FC with the power to control his own gravity levels, and create chains that don't follow the laws of physics. He can use these chains to push and pull things. And also as a method of getting around (kind of like a grappling hook. ya boi may make custom sprites for a "monkey bar" type animation though, so that he doesn't have to always spider man it.) He can only use these chains when he has his goggles on. And with that, I hope you like him! I'll probably add some updates and stuff (such as custom sprites, a personality bio etc). Feel free to use him in animations as long as you credit me of course. That's a really cool and unique power. you should definitely use him in animation so we can see him in action! @Rapidfir3Pho3nix wrote: That's a really cool and unique power. you should definitely use him in animation so we can see him in action! Thanks! I'll be sure to! IS GUD MAN where did you get the sprite sheet? did you make it? Thanks, it took a few days when I made it- seems you guys think it was worth it! @RainbowPotchy wrote: IS GUD MAN where did you get the sprite sheet? did you make it? Thanks bro! 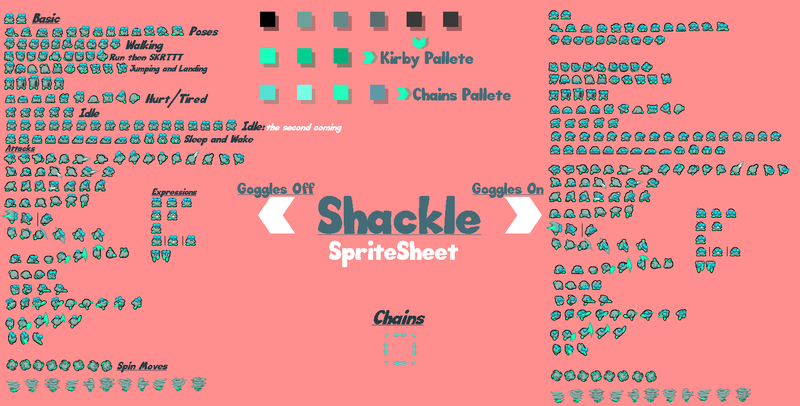 I used this spritesheet: https://nintendosteven.deviantart.com/art/Basic-Kirby-Sprite-Sheet-updated-284952708 , but I plan to edit a more complex one and expand Shackle's sheet. If you mean "did you make it" in the original sheet's case, no. But I did everything else.